This “The Canadian” Custom hat features silverbelly fur felt with the Canadian crease. 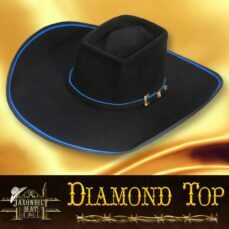 This hat has a 4 1/2 inch brim with a Limestone specialty ribbon bound edge. 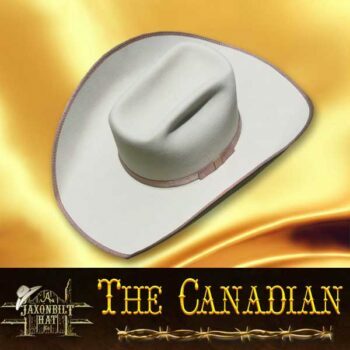 “The Canadian” known for the crown crease, is modified from the traditional cattleman with a bit wider and squared off center crease. Not an ordinary hat, this hat reflects traditional values as well as giving the wearer a nontraditional feeling. 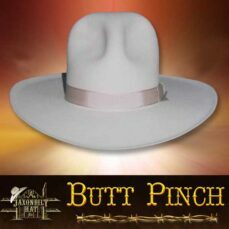 This is a hat for the woman or man who likes a hat with great proportions. Choose your color and quality.